Public Authorities play a major role in delivering public services in the United States. They supplement more traditional government agencies by: providing a corporate organizational structure, legally separate from government, for the provision of public services financed by user fees and whose capital investments are self-financed through tax exempt bonds; and managing capital assets and making long term capital investment decisions with some isolation from political influence and the electoral cycle. Public Authorities affect people in countless ways. They maintain bridges and highways, run mass transit systems, build and manage low income housing, financing higher education, and provide medical care. There are more than 35,000 state and local public authorities and special districts in the United States responsible for more than 65% of the states’ aggregate indebtedness. The Federal government and other nations have enthusiastically followed suit and adopted the public authority model. Public Authorities are now the fastest growing component of the public sector, and with their growth, questions have been raised concerning their power to incur debt, the transparency of their operations, and their political autonomy. Much has been written, many reforms proposed, and volumes of data has been generated and analyzed. The Public Authority Information Clearinghouse is intended to assemble and categorize, on an on-going basis, the available information, and in certain instances, provide commentary. On April 15, 2011, the Government Law Center assembled a panel of experts, including a representative of the Securities and Exchange Commission, to discuss the implications of Dodd-Frank, and current budget challenges, on municipal securities issuers. The program discussed the new registration requirement for municipal advisors (and related rule-making activities) and disclosure requirements associated with the current fiscal crisis, including those involving post-employment benefit obligations. Associate Dean Patricia Salkin and Professor Christine Chung gave remarks prior to the panel, which was moderated by Scott Fein, a partner at Whiteman Osterman & Hanna and chair of the GLC’s Public Authorities Project. 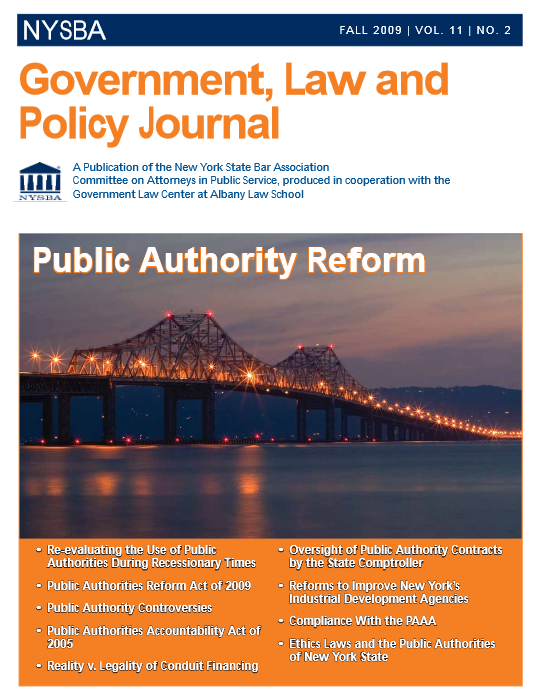 The Fall, 2009 issue of the NYSBA Government Law and Policy Journal was devoted to the topic of public authority reform, and was guest edited by Public Authorities Project director Scott Fein. Download the entire journal here, or select from the individual articles below. Charles Brecher, What Happened to Authority Reform? Dennis C. Smith, Are New York State’s Public Authorities Performing Well? Who Knows?